Fifteen years and a lot has changed… or has it? In 2003 it took “15 minutes to save on car insurance.” We challenged this with our newest technology and share the results below. While that ad campaign has been running for nearly 16 years, the rest of the world has moved along to expect the speed and ease of Amazon 1-Click, online banking, hulu-streaming, and consuming products and services in the digital first world we live in. Unfortunately, the issues go deeper than an application’s pretty face. To make money, carriers need binds. To get binds, carriers need quotes. To get quotes, carriers need solid application completion rates. Fixing the application process has a direct impact on the top line. Besides completion rates, data accuracy leaves much to be desired. If a consumer can’t answer a question, she has two options: take a guess or drop off the application. The former produces poor data; the latter is a lost sale. All the barriers to completion and all the customer drop-offs mean that the cost of acquisition is needlessly high. At Fenris, we always look for ways to make the application process faster and easier for the benefit of both the carrier and the consumer. Using our combined decades of insurance-industry experience, we developed a hypothesis: consumers would be willing to scan their drivers’ licenses to by-pass the complex application completion process. We decided to run a test. Over a ten-week period, we directed consumers from several states to a client’s online, branded auto insurance website. No app to download; this is seamlessly introduced via a browser. We detected if they were using a mobile device and routed the 92% who were mobile users to our test, where they are given a choice. 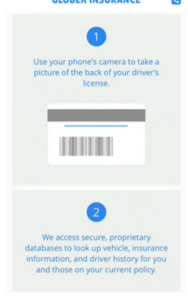 They could opt to 1) manually fill out the application – or – 2) follow instructions to take a picture of their driver’s license to speed through the process. The results were better than expected. Not only was overall completion rate up 10 percentage points for the test group, but nearly 1 in every 2 users opted to instantly scan their license and proceed with pre-fill. The customer adoption rate for such a brand new technology is highly encouraging, and will only increase over time. The economics are very compelling. Holding everything else constant, the cost of acquisition is predicted to decrease by 25%, bringing greater bang for each and every marketing buck spent bringing potential customers into the acquisition funnel to complete a quote. It stands to reason there are similar benefits in accuracy, speed, and completeness for agents filling out applications on behalf of their customers as we saw with consumers directly filling out their applications. You would benefit from using Fenris’s LicenseSnap. This is an opportunity to pleasingly serve the vast majority of traffic coming from mobile devices, reduce the frustration of your consumers, and show that you care about them while saving money and improving your top line. Talk to us about further enrichment and our smart real-time scores which streamline the application for “all swipe no type.” How does that resonate as the next gen marketing campaign of the next 15 years of online insurance quoting? Want to try LicenseSnap? Try here on your mobile device. Jennifer Linton is CEO of Fenris, Inc and has been an expert and innovator in InsurTech. She has been instrumental in the launch from scratch of several large initiatives as well as the launch of several companies in the insurance industry including Elephant Insurance and DriveFactor (now a division of CCC Information Services called CCC Drive). Jennifer is a graduate of the Darden School of Business.